These are very popular in our house. Be warned, they are really tasty! 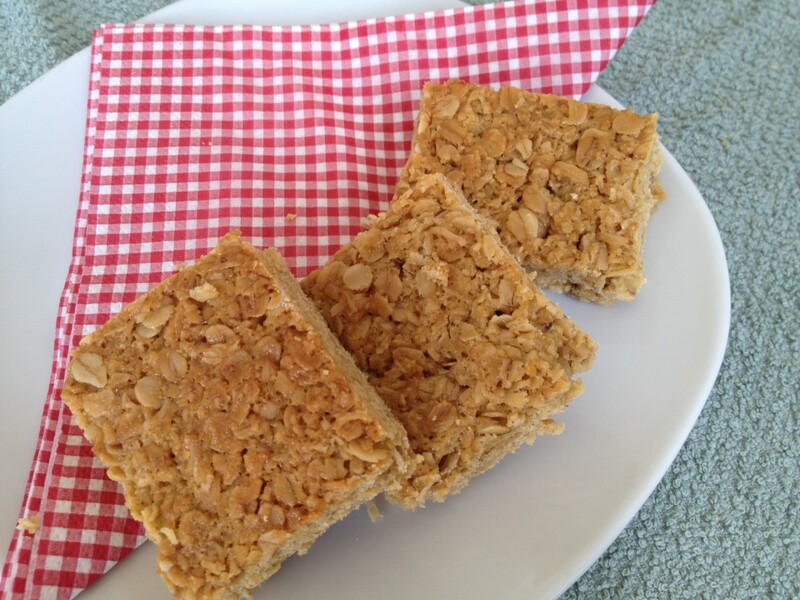 They are packed with oats so they provide good slow-release energy for kids and adults alike. Preheat the oven to 180C (350F), gas mark 4. Place the butter, golden syrup, sugar and vanilla extract into a large saucepan. Bring to a simmer and stir, allowing the butter to melt and form a smooth sauce. Remove from the heat and add the flour, oats and coconut. Stir to mix and pour into the Swiss roll tin, spreading evenly into each corner and smoothing the surface of the oats with the back of the spoon. Bake in the middle of the oven (too close to the top will cause them to burn) for 20-25 minutes or until golden brown. Remove from the oven and leave to cool in the tin. Once cool, cut into squares and store in an airtight container.